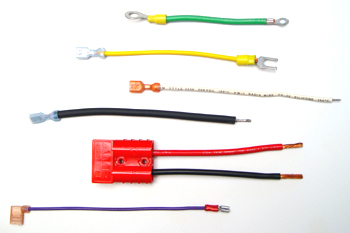 A single wire cut to length either with or without terminals. We offer the most current cut, strip terminate machines available. Each machine has crimp force monitoring on each press. This helps control the crimp of each terminal to meet the manufactures crimp tolerance. This in combination with manual pull off requirements, assure 100% conductivity and that it will meet UL and CSA standards. 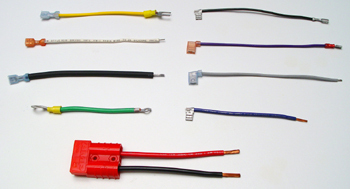 Wires are always crimped with the manufactures recommended tooling.